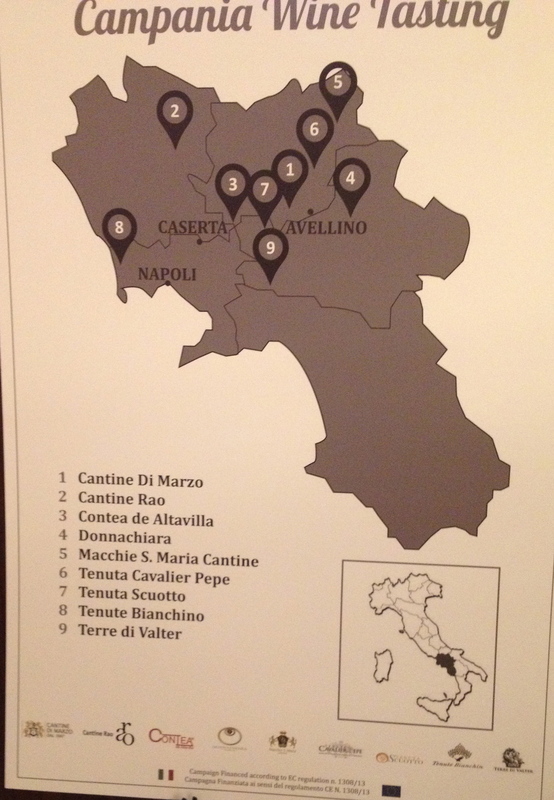 Nine producers from Campania came to Il Gattopardo Restaurant in NYC to present their wines at a luncheon and seminar. Each producer brought one special wine, which was matched with a seasonal Neapolitan dish. 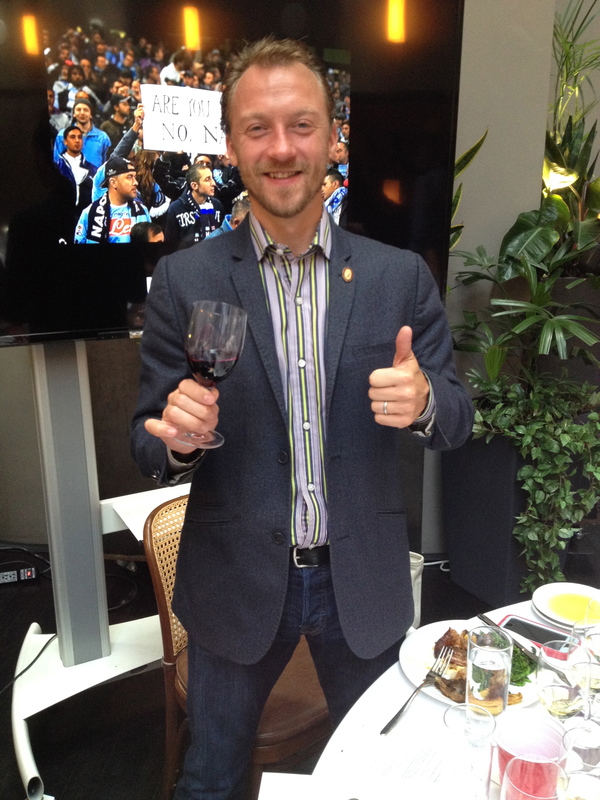 Master Sommelier Fred Dexheimer, who delivered an excellent presentation, presented the tasting. I wrote about the 5 white wines in a previous blog. Il Gattopardo, one of my favorite restaurants in New York, is owned by Gianfranco Sorrentino. They specialize in Neapolitan cooking. It was the ideal place to enjoy a Campania Wine Tasting. Here are the four red wine and the dishes they were matched with. All the wines are made from the Aglianico grape. Taurasi Riserva 2008 “La Loggia del Cavaliere” Tenuta Cavalier Pepe. 100% Aglianco The vineyard is at 450/490 meters and the exposure is south/southeast. The soil is clay-like with calcareous and sandy layers. Harvest is by hand in mid-November. In the cellar, cold maceration is followed by alcoholic fermentation with prolonged maceration. The wine is aged in barrels for a minimum of 18 months with batonnage (stirring the lees). The wine has hints of blackberries, black cherries with a touch of spice and vanilla. 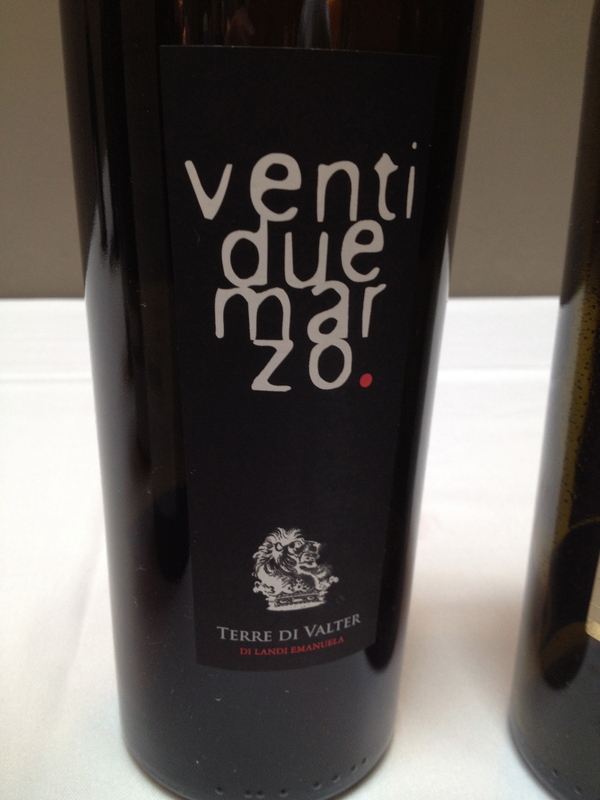 Aglianico Irpinia DOC 2013 “Ventidue Marzo” Terre di Valter. 100% Aglianico from the Torre le Nocelle vineyard. Grown mostly in hillside soils of volcanic origin and clay. Exposure is southeast, the vineyard is at 400 meters, and the age of the vines is 20 years. There are 4,000 vines per hectare and the training system is espalier culture with a spurred cord pruning. Harvesting is by hand, at the end of October, first days of November. Soaking takes place for 15 days and fermentation partially carried out with autochthonous yeast. The wine is aged in French durmast oak barrels for 6 months. It has hints of violets and red and black berries. This is a family run winery named in honor of Valter Landi His children, Emanuela and Roberto, an agronomist, carry on his work. These two wines were served with Paccheri alla Genovese, large pasta tubes with a meaty onion sauce. It is a classic Neapolitan dish and I almost always order it when I go to Il Gattopardo. 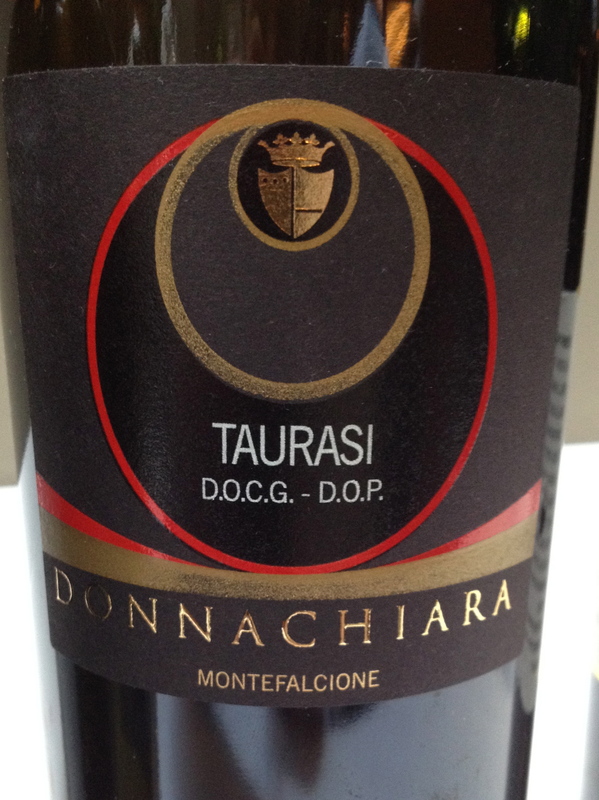 Taurasi DOCG 2010 100% Aglianico Macchie Santa Maria. This is a new winery with a production of only 3,000 bottles. It is located in the province of Avellino at Montemiletto. This is a wine with hints of sour cherry, plum and a touch of spice. 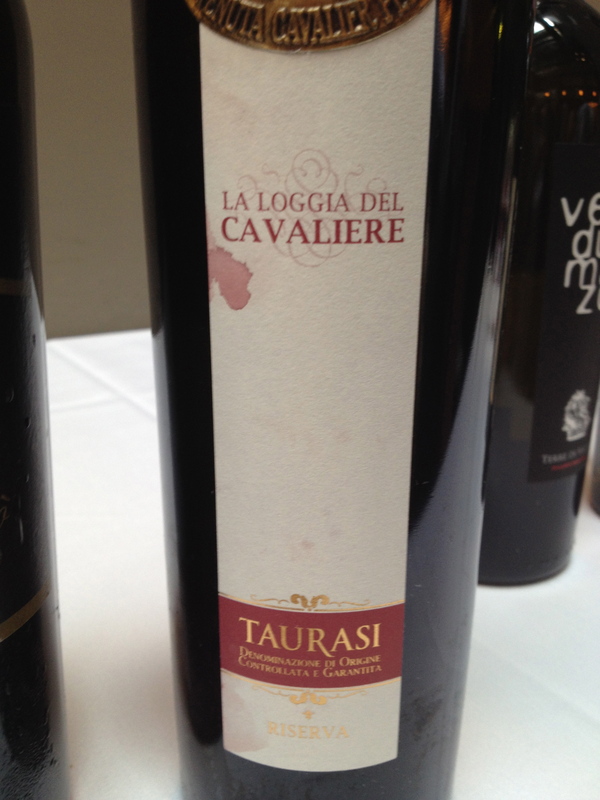 Taurasi DOCG 2011 100% Aglianico. DonnaChiara. Ilaria Petitto, owner of the winery, was in attendance. She said that all of Donnachiara’s red wines are made from grapes from the 20-hectare Torre le Nocella vineyard. The soil is volcanic and clay, the vines are over 30 years old, the training system is Guyot and there are 4,000 plants per hectare. The grapes are not destemmed or crushed prior to pressing and there is no filtration. The wine is aged for 12 months in 225-liter French barriques, and 24 months in bottle before release. This is a big complex wine with berry aromas and flavors, hints of cherry and plum and a touch of cacao, coffee and vanilla. The wine will age. Ilaria said that the winery philosophy includes taking care of the environment and they now use solar panels and recycled rainwater. The wines will soon carry the “sustainable wine” certification label, by which consumers will be able to obtain all the information about DonnaChiara’s production. These two wines were served with Capretto al Forno con Padellata di Friarielli e Patate, roasted goat with sautéed broccoli rabe and potatoes. For dessert there was a classic Pastiera Napoletana, a tender cheesecake with wheat berries and orange flower water.